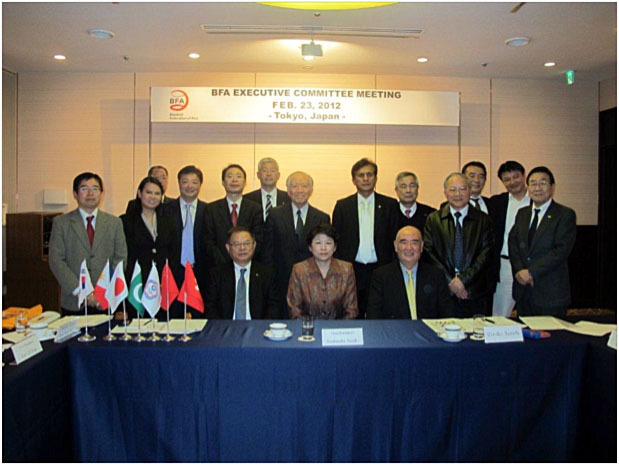 The Executive Committee of Baseball Federation of Asia (BFA) met in Tokyo on February 23, 2012 to streamline the Asian competition calendar in response to the new Format of International Tournaments adopted by IBAF at its Congress in Dallas last December, as well as to discuss some other important issues, which will be reported to IBAF President by the BFA Secretariat later. The meeting was chaired by BFA Vice President Yoshinobu Suzuki of Japan, delegated by President Seung-Kyoo Kang of Korea who could not join owing to other pressing needs, and was joined by representatives from China, Chinese Taipei, Hong Kong, Korea, Pakistan and Philippines. The 3 major sponsors, Mizuno, SSK and Nagase-Kenko were also invited to the meeting followed by a joint dinner. The Executives agreed that the success of reinstatement of baseball in 2020 Olympic Games is crucial for the future development of baseball and pledged support to the works of IBAF Olympic Reinstatement Commission led by President Riccardo Fraccari.